With prescription drug abuse reaching epidemic proportions, police say there’s a new face of drug dealing; the elderly. 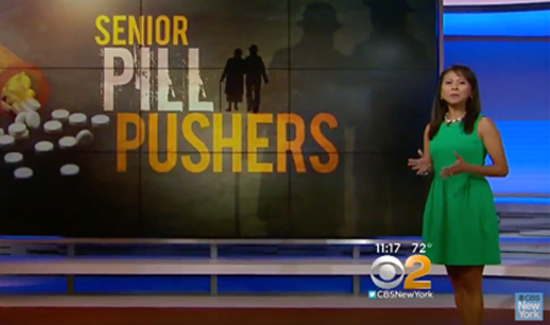 As CBS2’s Hazel Sanchez found out, senior pill pushers are increasingly getting caught selling their own stash. “This girl came to me and said that, ‘I hear you got some pills,” Laura Viehdeffer said. So 85-year-old Viehdeffer said she gave her a couple. “I felt sorry for her,” she said. The girl was actually an undercover police officer in upstate New York. The pills — which she bought for $10 a piece — were the powerful opioid hydrocodone which Viehdeffer took for arthritis pain. “I was just trying to help somebody out,” she said. The authorities didn’t quite see it that way, and now Viehdeffer is the oldest person in her county ever charged with drug dealing. “If someone is selling drugs, narcotics, to someone else without a prescription, that is in fact illegal,” Steve Chassman said. Increasingly, experts say the ‘someone selling’ is a senior citizen. “It’s not uncommon to see people 55 and older, who receive monthly medications, selling some on the street or to people they know,” Chassman said. Chassman is with the Long Island Council on Alcoholism and Drug Dependence. “A 30 milligram of oxycodon can go for $30 and if you get a 90 day supply, do the math. That’s significant,” he said.